Kitchen organization isn’t just about making sure everything labeled and put in the right place! The kitchen is where the magic happens! Not only is it the place you cook with your loved ones, but it hosts family meals, and in our case, impromptu family dance parties. With this much time being spent in one place, we like to use it as an opportunity to add style alongside with all the function. 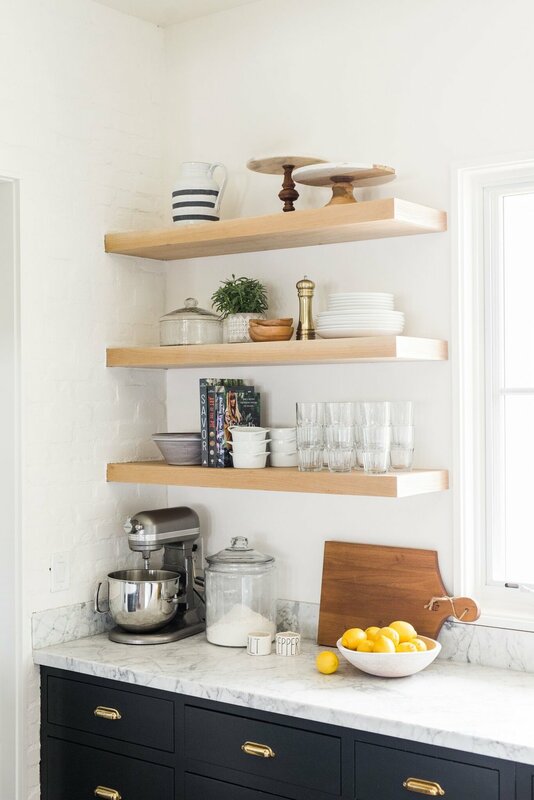 With open shelving, you want to think about balance. When it comes to organization, think about placing what you use most often on the lower shelves. It’s still open, so styling is key. Balance materials, add decor that doesn’t take up space! Play with the layout by playing with the shapes, sizes, and scale of each piece. 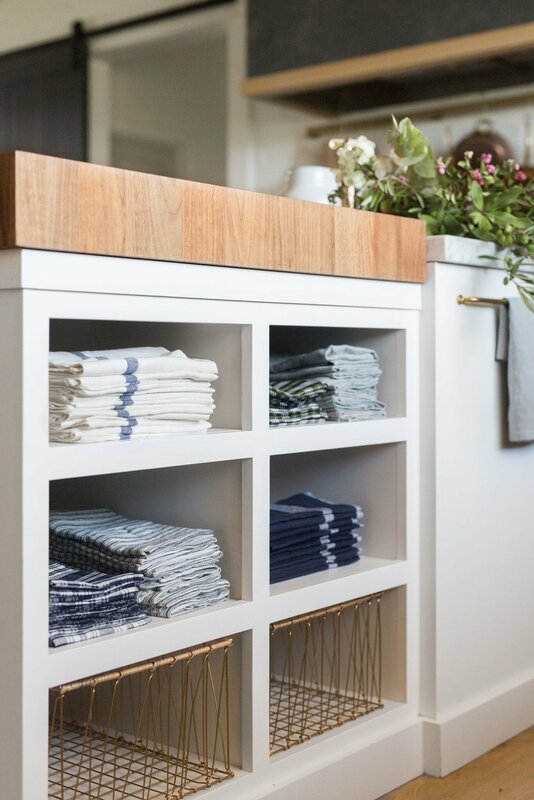 We have a helpful webisode here that talks about styling open shelves. Next is the pantry. It’s a little more hidden, but it’s not that much more work to take it to the next level. 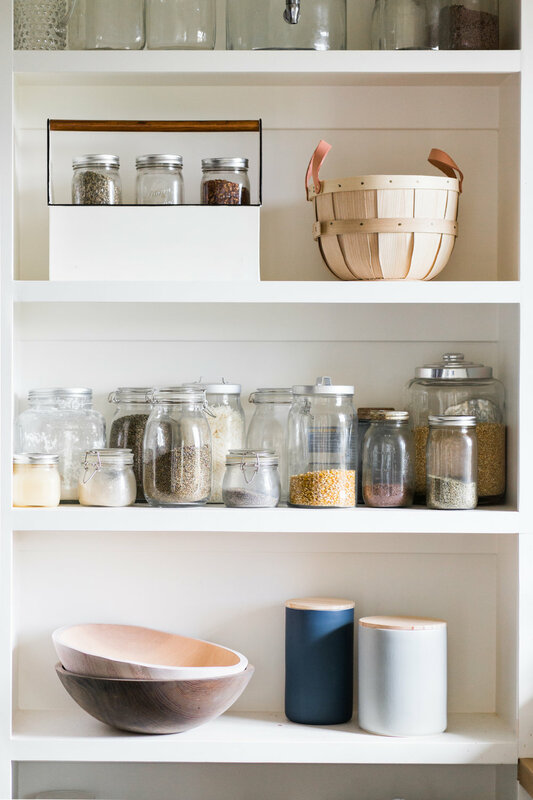 We’ll place bags of flour, sugar, and oats into canisters to freshly store items while creating a beautiful display. Next, you can corral similar items with trays and baskets. That’ll break up the clutter, provide visual distinction, and make your pantry easy to navigate. Corral smaller items: Bread boxes, baskets, and bowls can corral smaller jars and items in the kitchen, laundry, and sink areas. Clutter-free decor: Bread boxes and canisters are a cute, clutter-free way to add functional decor. Grab-n-go: Make life easier by using baskets to hold loose snacks, so your kids can grab treats on the go. We’ll also use these to store long-lasting product like potatoes and apples. Around the stove, you want to have your essentials handy. Keep a crock with the utensils you use most often (not every single tool you’ve ever bought), a spoon rest, a towel for messes and a towel for styling. Leave a towel you don’t care about out when cleaning up spills, and a pretty one for keeping hands dry. 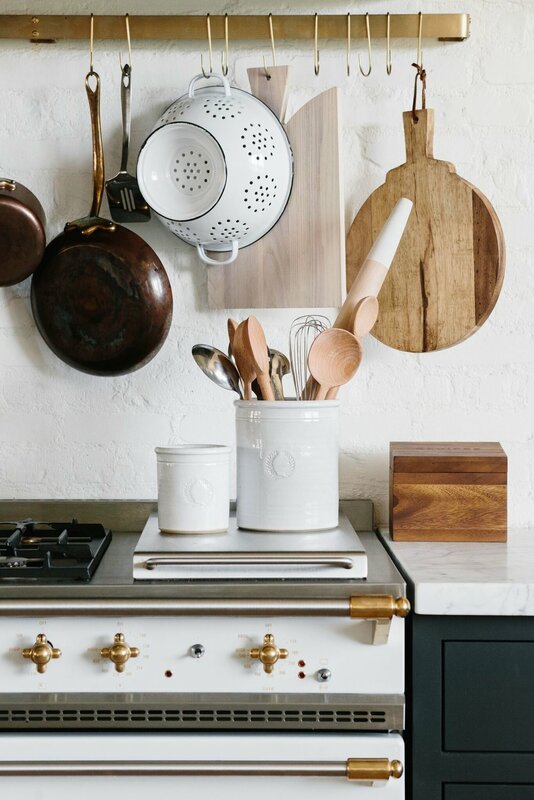 You need plenty of counter space available, so you don’t want it to feel cluttered, but we like it to feel full with a few key accessories on display. Cutting boards add an organic warmth and are functional. 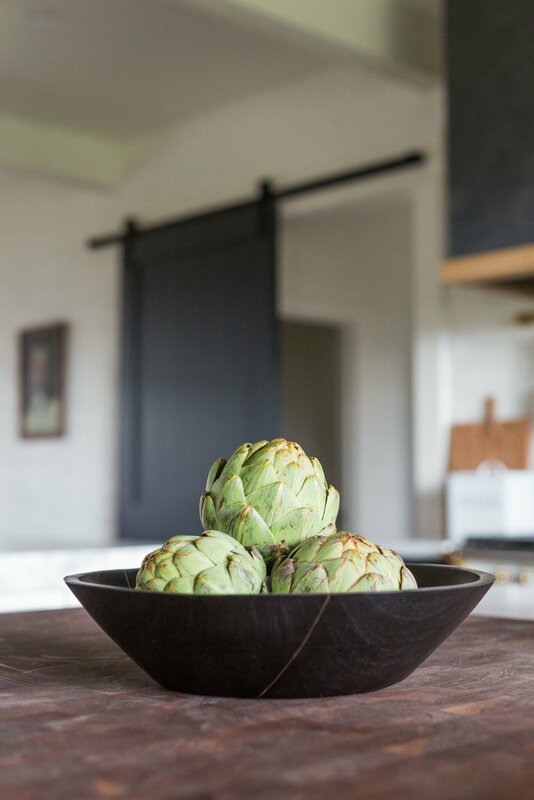 A large bowl will corral your produce. 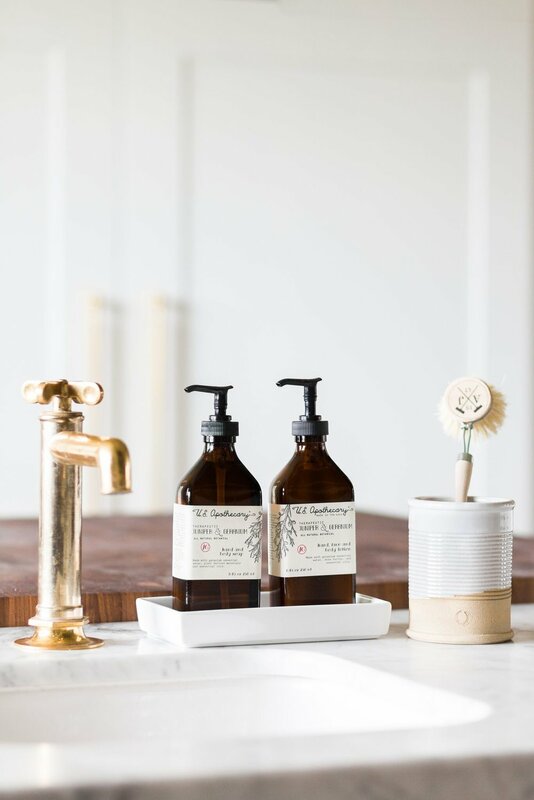 By the sink, we’ll always do a towel, plant, soap, and cute dish brushes. We love this new design trend of having built-ins on the island. It gives more opportunity for styling and storing things in an accessible place!